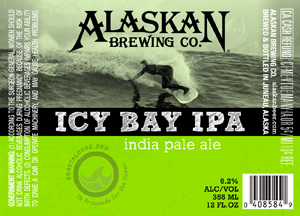 JUNEAU, AK—The Alaskan Brewing Company has updated its IPA, which was first released year-round in 2007. As inspiration for the new flavor profile, the Brew Crew looked to the intense experience of Alaskans who travel the state’s coastlines in search of epic surf. One of those Alaskans is photographer Scott Dickerson, who provided the photo now on bottles of newly-released Icy Bay IPA.